Supergroup Cream will mark the 50th anniversary of their 1966 debut, “Fresh Cream”, with an expanded reissue on January 27. A Deluxe Edition of the first studio album by the power trio of Eric Clapton, Jack Bruce and Ginger Baker has been packaged as a 3CD + 1 Blu-ray audio disc set featuring various alternate and new stereo mixes plus several, previously unreleased BBC sessions. Presented in a gatefold sleeve within a rigid slipcase, the reissue includes a 64-page hardback book featuring new sleeve notes by Rolling Stone writer David Fricke. A special 6LP 180g Vinyl edition of “Fresh Cream” will also be released in April 2017. 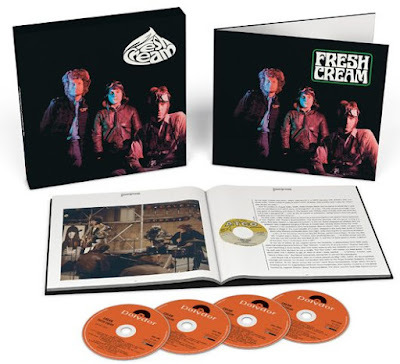 “Fresh Cream” originally delivered a UK version and a slightly different US version; the UK release included a cover of the Willie Dixon classic, “Spoonful”, while the tune was replaced by the group’s second hit and UK single, “I Feel Free”, on the US version. The project peaked at No. 6 on the UK album chart and No. 39 on the U.S. album chart while earning Gold status for sales in both countries. Cream disbanded following a farewell concert at London’s Royal Albert Hall in 1968. The group reunited for their 1993 induction into the Rock And Roll Hall Of Fame, and then again in 2005 for a series of London shows that were recorded and released that same year and promoted with additional concerts at New York’s Madison Square Garden. Bassist Jack Bruce passed away from liver disease in 2014 at the age of 71.